A SnapLOCK gutter downspout extension and flip-up can provide the flexibility needed when mowing, landscaping, or working around the home. Traditional fasteners have rivets and screws that wear and pull out, creating problems. Snaplocks provide the flexibility that screws and rivets cannot, making them the most reliable gutter extension fasteners available. Snaplocks are made of two pieces; an aluminum shaft and a nylon washer, which snap together. 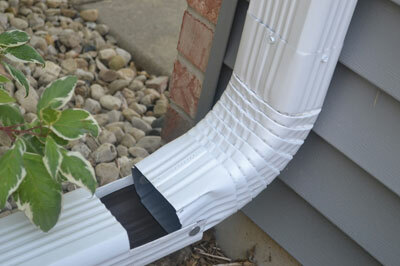 These materials make Snaplocks durable, so they last and keep gutter extensions from falling off. For homeowners, SnapLOCK gutter systems are long lasting and allow for complete ease of use when working around downspouts. For contractors, Snaplocks create a professional finish to any downspout work and provide the extra touch that customers look for.